There are a variety of purification practices, The Bodhisattva’s Confession of Ethical Downfalls being one of the most popular. We all have done actions that we now feel badly about doing, and we have aspects of ourselves that we do not like and wish to change. Purification practices are excellent means to remove emotional burdens such as guilt, as well as to pacify the obstacles to our happiness and self-improvement created by the imprints of our destructive actions. Guilt over past actions is useless, only leaving us feeling helpless and hopeless. On the other hand, acting to purify destructive imprints and afflictions is very productive. It helps us to change our bad habits and subdues obstacles to long life and success in our spiritual practice. The power of regret for having done the destructive action. The power of reliance: taking refuge, which restores our relationship with holy objects, and generating the altruistic intention, which restores our relationship with other sentient beings. The power of the remedial action, e.g. prostration, offering, reciting the names of the Buddha, reading or contemplating the Dharma, etc. The power of the promise not to repeat the action. These four opponent powers are found in The Bodhisattva’s Confession of Ethical Downfalls, the Vajrasattva meditation, and other practices. 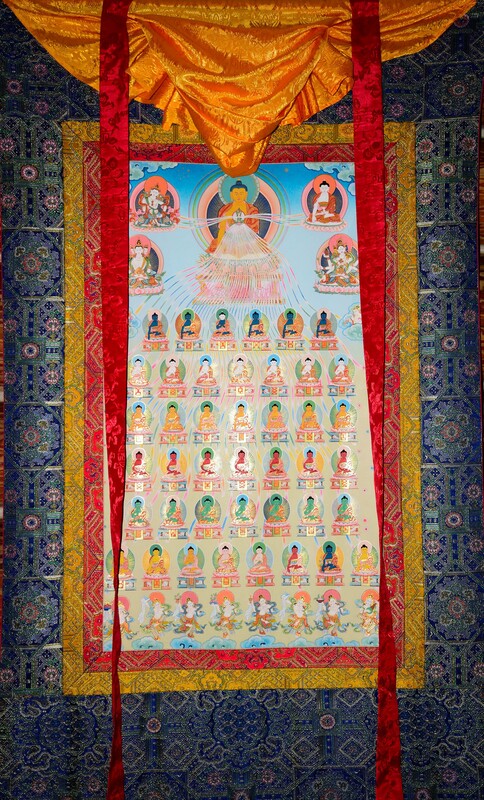 There are several visualizations of the 35 Buddhas. 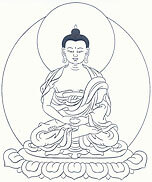 The easiest is to visualize Shakyamuni Buddha, golden in color, with 34 light rays coming from his heart. These light rays form five rows and upon each ray is seated a buddha. The buddhas in each row resemble one of the five Dhyani Buddhas. In the first row are the next six Buddhas mentioned in the prayer. 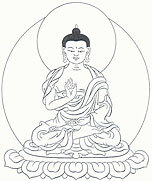 They resemble Akshobya Buddha, blue, the left hand in his lap in the gesture of meditative equipoise, the right hand in the earth-touching gesture (on the right knee, palm down). However, the One Thus Gone, the King with Power over the Nagas, looks slightly different: he has a blue body, a white face, and his hands are folded together at his heart. In the second row, the next seven buddhas resemble Vairocana Buddha, white, with both hands at the heart, the index fingers extended. In the third row, the next seven buddhas resemble Ratnasambhava Buddha, yellow. 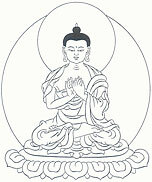 His left hand is in meditative equipoise, and his right hand is in the gesture of giving (on the right knee, palm outwards). In the fourth row, the next seven buddhas resemble Amitabha Buddha, red, with both hands in meditative equipoise on his lap. In the fifth row, the next seven buddhas resemble Amogasiddhi Buddha, green. The left hand is in meditative equipoise and the right arm is bent at the elbow with the palm facing outwards. Visualize that you are surrounded by all sentient beings in human form and that you are leading them in prostrating to the Buddhas. While prostrating, imagine much light coming from the Buddhas and flowing into you and into all the sentient beings around you. This light purifies all imprints of destructive actions and all afflictions. After this, visualize the 34 Buddhas dissolve into Shakyamuni Buddha. He comes on top of your head and melts into golden light. The light descends through the crown of your head and goes to your heart chakra, in the center of your chest. Feel that all negative karma and obscurations have been completely purified and that your mind has become inseparable from the Buddha’s pure mind of wisdom and compassion. om namo manjushriye namo sushriye namo uttama shriye soha. To the Founder, the Transcendent Destroyer, the One Thus Gone.1 the Foe Destroyer, the Fully Awakened One, the Glorious Conqueror from the Shakyas I bow down. To the One Thus Gone, the King with Power over the Nagas I bow down. To the One Thus Gone, the Leader of the Warriors I bow down. To the One Thus Gone, the Son of the Desireless One I bow down. To the One Thus Gone, the Glorious Flower I bow down. To the One Thus Gone, Who Understands Reality Enjoying the Radiant Light of Purity I bow down. To the One Thus Gone, Who Understands Reality Enjoying the Radiant Light of the Lotus I bow down. To the One Thus Gone, the Glorious Gem I bow down. To the One Thus Gone, the Glorious One who is Mindful I bow down. To the One Thus Gone, the Glorious One whose Name is Extremely Renowned, I bow down. To the One Thus Gone, the King Holding the Banner of Victory over the Senses I bow down. To the One Thus Gone, the Glorious One who Subdues Everything Completely I bow down. To the One Thus Gone, the Victorious One in All Battles I bow down. To the One Thus Gone, the Glorious One Gone to Perfect Self-control I bow down. To the One Thus Gone, the Glorious One who Enhances and Illuminates Completely I bow down. To the One Thus Gone, the Jewel Lotus who Subdues All I bow down. To the One Thus Gone, the Foe Destroyer, the Fully Awakened One, the King with Power over Mount Meru, always remaining in the Jewel and the Lotus I bow down. To the Buddha, Renowned Glorious King of Excellent Signs, I bow down. To the Buddha, King of Melodious Sound, I bow down. To the Buddha, Stainless Excellent Gold, I bow down. To the Buddha, Supreme Glory Free From Sorrow, I bow down. To the Buddha, Melodious Ocean of Renowned Dharma, I bow down. To the Buddha, Delightful King of Clear Knowing, I bow down. To the Medicine Buddha, King of Lapis Light, I bow down. All you 35 Buddhas, and all the others, those thus gone, foe destroyers, fully awakened ones and transcendent destroyers who are existing, sustaining and living throughout the ten directions of sentient beings’ worlds—all you Buddhas, please give me your attention. 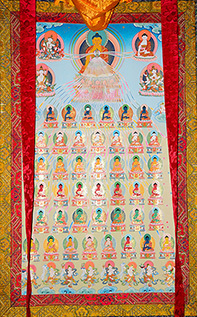 In this life, and throughout beginningless lives in all the realms of samsara, I have created, caused others to create, and rejoiced at the creation of destructive karmas such as misusing offerings to holy objects, misusing offerings to the Sangha, stealing the possessions of the Sangha of the ten directions; I have caused others to create these destructive actions and rejoiced at their creation. I have created the five heinous actions,2 caused others to create them and rejoiced at their creation. I have committed the ten non-virtuous actions,3 involved others in them, and rejoiced in their involvement. Now before these Buddhas, transcendent destroyers who have become transcendental wisdom, who have become the compassionate eye, who have become witnesses, who have become valid and see with their omniscient minds, I am confessing and accepting all these actions as destructive. I will not conceal or hide them, and from now on, I will refrain from committing these destructive actions. Buddhas and transcendent destroyers, please give me your attention: in this life and throughout beginningless lives in all the realms of samsara, whatever root of virtue I have created through even the smallest acts of charity such as giving one mouthful of food to a being born as an animal, whatever root of virtue I have created by keeping pure ethics, whatever root of virtue I have created by abiding in pure conduct, whatever root of virtue I have created by fully ripening sentient beings’ minds, whatever root of virtue I have created by generating bodhicitta, whatever root of virtue I have created of the highest transcendental wisdom. Bringing together all these merits of both myself and others, I now dedicate them to the highest of which there is no higher, to that even above the highest, to the highest of the high, to the higher of the high. Thus I dedicate them completely to the highest, fully accomplished awakening. Just as the Buddhas and transcendent destroyers of the past have dedicated, just as the Buddhas and transcendent destroyers of the future will dedicate, and just as the Buddhas and transcendent destroyers of the present are dedicating, in the same way I make this dedication. I confess all my destructive actions separately and rejoice in all merits. I implore all the Buddhas to grant my request that I may realize the ultimate, sublime, highest transcendental wisdom. To the sublime kings of the human beings living now, to those of the past, and to those who have yet to appear, to all those whose knowledge is as vast as an infinite ocean, I go for refuge. O Spiritual Masters, great Vajra Holders, and all the Buddhas and bodhisattvas who abide in the ten directions, as well as all the venerable Sangha, please pay attention to me. I, who am named _________ , circling in cyclic existence since beginningless time until the present, overpowered by mental distortions such as attachment, hostility and ignorance, have created the ten destructive actions by means of body, speech and mind. I have engaged in the five heinous actions and the five parallel heinous actions.4 I have transgressed the vows of individual liberation,5 contradicted the trainings of a bodhisattva,6 broken the tantric commitments.7 I have been disrespectful to my kind parents, spiritual masters, spiritual friends, and those following the pure paths. I have committed actions harmful to the Three Jewels, avoided the holy Dharma, criticized the arya Sangha, and harmed living beings. These and many other destructive actions I have done, have caused others to do, and have rejoiced in others’ doing. In short, I have created many obstacles to my own higher rebirth and liberation, and have planted countless seeds for further wanderings in cyclic existence and miserable states of being. Now in the presence of the spiritual masters, the great Vajra Holders, all the Buddhas and bodhisattvas who abide in the ten directions, and the venerable Sangha, I confess all of these destructive actions, I will not conceal them and I accept them as destructive. I promise to refrain from doing these actions again in the future. By confessing and acknowledging them, I will attain and abide in happiness, while by not confessing and acknowledging them, true happiness will not come.